HANOI, VIETNAM—Ba Sao Investment recently installed a complete audio system by HARMAN Professional Solutions at the Vietnam National Drama Theatre. 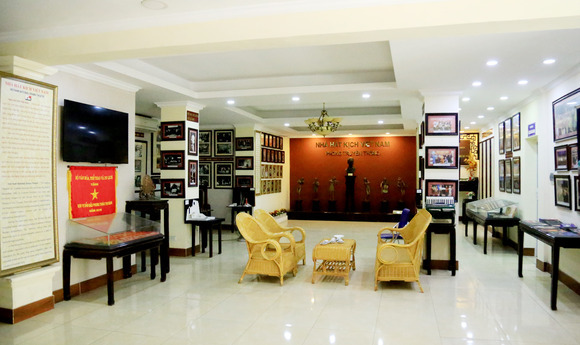 Founded in 1952, the Vietnam National Drama Theatre has hosted dramatic performances in the Vietnamese capital of Hanoi for more than half a century. The building was recently redeveloped as a modern dramatic arts center to accommodate the increasing demands of popular international touring productions. In order to complement the recent renovations and ensure world-class audio quality for audiences, the National Drama Theatre hired Ba Sao Investment to upgrade its aging audio system with a complete HARMAN audio solution. The audio system in the National Drama Theater consists of JBL VRX900 Series line arrays, JBL PRX700 Series powered speakers, Crown Macro-Tech I Series amplifiers, a BSS Minidrive loudspeaker management system and a Soundcraft Si Expression series digital mixing console. The JBL VRX928LA compact two-way line array speaker’s amplitude shading feature makes it easy to adjust each speaker’s high-frequency output for a consistent response in the theater. JBL VRX915S bass-reflex subwoofers offer powerful bass frequencies in a compact footprint. PRX712 two-way powered speakers provide perfect front-fill coverage for the first few rows. The system is powered by reliable Crown MA 5000i amplifiers, offering powerful performance and unmatched reliability. The speakers are tuned using a BSS FDS-334T Minidrive loudspeaker management system, which combines limiting, EQ, crossovers and input/output delay in a single comprehensive unit. Finally, a Soundcraft Si Expression 3 digital audio console provides the versatility and complexity needed to mix modern theatrical productions.